Pro - refugee activists are invited! Please inform the refugees you know to join us and spread the call!! from 11 am until 2 pm - break - then from 3 until 6 pm. Bisso G. comes to speak about his resistance in Lager and his 3 years long Residenzpflicht trial. What means we have to stop a Deportation: The case of Osman. Discussion with Maissara Saeed and Osman Tigani. 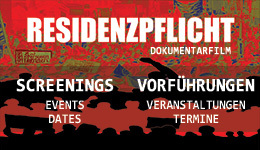 CIVIL DISOBEDIENCE: abolishing Residenzpflicht from below. A challenge which needs to make stronger the international solidarity of refugees and migrants fighting back the neocolonial order. • Behind Dublin2 are economic interest to establish two levels of wealth • Some companies involved in the EU Border regime make big money, for example with surveillance equipment. • It's important to see how the West exploits the South, how colonial exploitation continues. Dublin2 is part of colonialism and of Europe´s endless project to keep the rich up and the poor down. • The economic crisis of the imperialistic system; the more it grows the more the oppressed people fight. The metropolitan countries like Germany, France, Britain defend themselves against by keeping those countries they have exploited in impotence. They don’t want to have the people because they don’t have the work to cut them put in. The political reason is that the European Union has failed. They have pretended to abolish borders but it´s a lie. Everywhere you are confronted with racist and fascist ideologies. Overview on the movement´s recent history from the start of the protest in march until today. • Importance of the camp is the open space for refugees to unite their struggles by creating the colours of resistance from the camp. Fight and struggles of The VOICE Refugee Forum and Caravan for the rights of refugees and migrants to reclaim the public space, strikes, deportation stop and lager closures including the call for civil disobedience started more than 15 years ago in Germany by refuges. Great that this camp is here in the middle of Berlin for the empowerment of our struggles. The Camp is possible because of our continuity and Connection between break isolation campaign and protest march made it the actual movement we are proud to live with. In the camp people can be united. We, the refugees, don’t need help from anybody, we need ourselves and we all must work together to break the colonial injustice and everyone of us should have the courage to speak out without compromise. Everybody needs help because of the same problems. The camp is everything. For new people – identify individual problems, the rights and self determination to live a free life in Germany. The Camp creates space for your fight. Being here is preparation for the defense of your rights. We need to development of a platform to relate personal issues to a further struggle. Continuity will show about what we have achieved and about our mistakes. People from outside should use the camp for the fight. Our being together from different places is an example for live internationalism and solidarity. Send out the signal. The message. It is not enough to stop one or two deportations. The goal is to fight the system. The fight has not really started yet. The level has to go beyond the German level from here! Networking is a priority; all refugees must know themselves. The tribunal is meant to be a base for that: the refugees know themselves. It should also give the refugees an opportunity to reflect deeply on their situation. The personal story of each individual refugee must be documented. These individual stories will be the base for the accusation of the system at the tribunal. If all of these stories come together we have more than the march. Let's organize workshops to gather these information! • Civil disobedience is the base for the reclamation of power. We will do it through the existence of our physical presence. Natural resources is own power. Break out of your lager, Resist against your deportation! Where you are is your place. Disobedience is a political call. Once we are able to recognize that we can create a daily protest. Disobedience is not a question of being tough, or being a hero. To succeed we need to develop our communities. Here the Tribunal comes in. It is not a question of going to the parliament. Our mere presence here in the camp is worth more than having useless discussions with nationalist politicians in the parliaments. We are convinced of what we are doing. We know the EU government is destroying our countries. That is why we came here. We know how they create terrorism and wars by themselves. Nobody else can solve the problem but those who have the platform and network to speak out. We can do it for urselves. Nobody else. Every politician is a nationalist. Mobilize to the Camp is the main task of the refugee activists. To create solidarity between the refugees. This does not mean that we have to organize demonstrations to the lagers. It might be sometimes enough to make friends to organize picnic or barbeque with our friends who are *forced to live in the lagers. • About Caravan: This camp should work had to break the isolation and take back the power. Deportation is Elimination; it is the most invisible torture and militarization of the borders beyond the frontex. You have to crush the system to reach that. Frontex have taken the control of our countries. They are controlling our airports and the database of the citizens. Our fingerprinting is enough to know everything about us in Europe and beyond. And people say we fight for the caravan? IF EVERYONE COULD COMEOUT TO THE STREET LIKE HERE IN CAMP IN SOLIDARITY WITH THE OPPRESSED THEN THE REVOLUTION IS ACHIVED!! !